Engineering students with the UCSD Microgravity Team from the University of California, San Diego, stands near their biofuel experiment to test weightless flames ahead of a NASA Microgravity University flight at Ellington Field in Houston. The are: (clockwise from left): Joshua Siu, Sam Avery, Jack Goodwin, Andrew Beeler, Daneesha Kenyon, Joshua Sullivan, Nico Montoya, and Victor Hong. NASA mentor Christina Gallegos is not pictured. Image taken on July 18, 2013. HOUSTON — A student team of aspiring engineers will have to wait at least one more day to get a taste of zero gravity after Mother Nature spoiled its attempt to experiment with fire on a NASA microgravity flight today (July 18). Eight aerospace engineering students from the University of California, San Diego, had hoped to fly aboard a modified Boeing 727 jet designed to provide brief periods of weightlessness today as part of NASA's Microgravity University to provide students with opportunities for hands-on experience in space science. The weather on the flight range, which has been dismal much of this week, initially appeared encouraging this morning. Seven teams of classroom teachers flew on a morning flight. NASA is flying the Microgravity University flights on G-Force One, a jet owned by the Zero Gravity Corporation that is specially modified for acrobatic parabolic maneuvers that offer up to 30 seconds of weightlessness with each dive that is followed by a sting of "hypergravity" as the plane pulls 2 Gs (twice the force of Earth's gravity) on the upswing. The flights take off from Ellington Field here near NASA's Johnson Space Center and typically fly through airspace over the Gulf of Mexico that stretches from Matagorda Bay to Brownsville, Tex. Today, however, bad weather inland forced commercial flights to use the airspace reserved for NASA's afternoon flight. 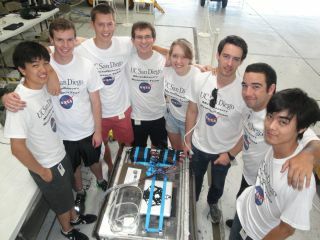 The next chance for the UCSD Microgravity Team to fly will be early Friday morning (July 19). The Microgravity University's flight week began on July 12 and is slated to run through July 20. "We're going to do everything we can to get these flights off," NASA's reduced gravity flight program manager for student campaigns told SPACE.com. A fuel droplet burns in one-G (Earth gravity), in the University of California, San Diego lab where undergaduate Sam Avery and his team are studying microgravity's effects on fire. Avery and his team are hoping for better weather on Friday. The team has invested more than $10,000 and 1,000 man-hours developing the experiment, which is designed to measure the size of biofuel flames in weightlessness. To do that, the students built a triple-contained system that uses a syringe, wires and igniter to spark a tiny flame in a half-minute. The research could be used to develop better ways to combat fires in space. SPACE.com is serving as the team journalist for the UCSD Microgravity Team to offer a glimpse of how weightless science is performed on Earth. Avery said the UCSD Microgravity Team has been supported by several sponsors, including the Canadian biofuel company W2 Energy, the UCSD Jacobs School of Engineering, the California Space Grant Consortium and the Ledell Family Scholarship. Editor's note: You can follow the progress of the NASA Microgravity University Program flight via the program's Twitter feed @NASA_RGEFP and by following the hashtag #DefyGravity. UCSD Microgravity Team member Nico Montoya has been posting updates about the team's work on Twitter at @NicoSuave9. West Virginia University: Optimization of Liquid Spray Cooling in a Variable Gravity Environment. Poinciana Elementary and Atlantic High School, Boynton Beach, FL: How Does Gravity Affect Convection? Riversink Elementary School, Crawfordville, FL: Wakulla Waters: A Liquid Investigation.